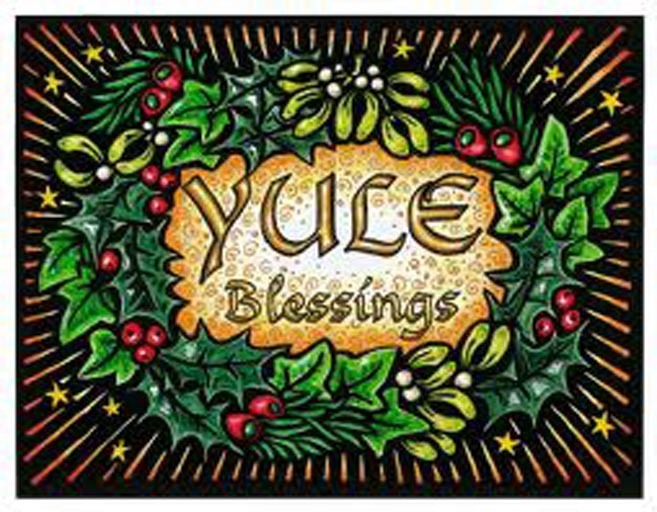 The day is finally here although Yule started earlier and lasts longer. Imperial Rome and the Christian church pinched a lot from earlier traditions and later on Islam pinched much as well. Odd that adherents of both religions become excited when this is pointed out to them? Lights, fire, good food including those slaughtered for feasting and drink featured large in the celebrations as life back then was often brutal and short. The nights were cold and dark with beasts, demons and other assorted ghosts and ghouls abroad looking to cause mischief. 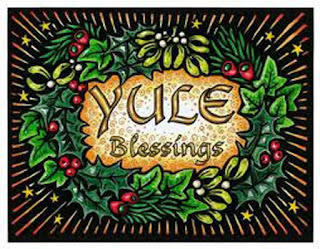 So enjoy yourselves and may your gods or lack of them go with you. 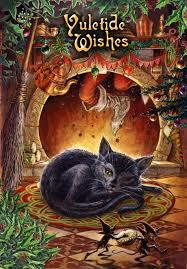 Two days to go and it doesn't feel like Christmas / Yule / Saturnalia as the weather is mild and wet with grey skies. Shopping all done not that we buy much with food bought for the main meal and the two days plus some wine, cheese and mince pies. The adverts on all media have been banging on about Christmas and the need for buying the latest gadget. Shopping adverts with happy, smiling multicultural multigenerational families and friends showing perfect lives amidst snowy winter scenes reminiscent of a Disney film. Happily, the mute button on the TV or avoiding the TV altogether is the answer. 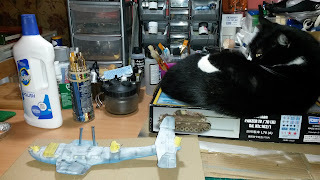 As you can see from the photo above I have been getting some model building done although Maisie was determined she wasn't go to move from her favourite spot. 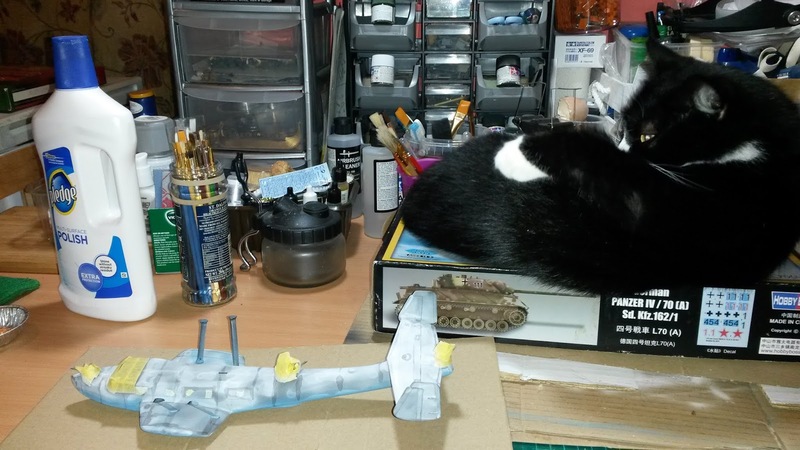 She loves that box and when that build is complete I will use the box for storage of spare plastic parts and leave it in place for her to sleep on. She gets anxious and over grooms, hence the various bald spots in her fur. So any little thing to reduce her anxiety helps. Aside from the modelling it has been a busy month at work and not slowing down. Demand is outstripping our capacity to meet it and so I have neglected the blog as tiredness has set in. Early nights and a very necessary recharging of my batteries each night. I find that as I get older I no longer have the stamina or energy by each Friday evening and my weekends are most welcome for rest and recuperation. I think I have officially become an old bugger! I have Christmas and Boxing days off but I am working the rest of the week as part of the skeleton crew which will keep the team going over the holiday. Mrs C. is still using the nicotine patches and apart from a 30 gram pack of tobacco each Wednesday evening following attendance at the smoking cessation meeting she has abstained from smoking. She has rediscovered a sweet tooth though and a keen sense of smell has also returned. As previously stated in an earlier blog she also has more money in her purse which she regards as a welcome bonus. Otherwise little else of note and I suspect this blog may well be neglected over the next few weeks as I have revalidation for my nursing qualification to complete before March as well as attending to my work. I have also been looking at 'new' used cars, that is a smaller and more economical car which shouldn't require too much outlay. I still have a hankering for a camper van but realistically the vans I can afford would not be suitable for work with the mileage I have to do. I still miss the old Suzuki WagonR and I do like the small Suzuki's on offer. So I have set a list that any car will have to meet: cheap but less than 3 years old, low mileage, comfortable, a DAB radio and air con, economical and will last for the next five years. The Celerio and Ignis do meet these requirements but who dreams up these names? I keep thinking of salad vegetables! The Mazda I currently drive is a lovely car but at ten years old and needing work done every time I service or MOT it, as well as being a thirsty beast, I think I will be trading it in next year. It's also quite difficult for Mrs C. and me to manoeuvre ourselves in and out of. Again, dreaded ageing rears its ugly head! Woohoo! I have four days off and boy do I need the rest. Too many miles travelled on dreadful roads in bad weather and the stress levels at work increase as we approach the festive season with fewer staff than usual. I finished work yesterday with a dreadful headache which finally dissipated late this morning. My fault entirely as I chose to return to the bear pit of work! But a couple of walks this morning with Sue in some very cold and blowy weather chased the ache away. So here's a photo of sunnier and younger times as we slide into this wet, cold and windy winter with the usual dire portents of 'Beasts from the East' Siberian weather. Yes, that's me in the middle, taken in Israel in the autumn of '83. I think we'd just showered and had lunch following a day of picking citrus fruits. Work started at 6 a.m. and depending on how quickly we fulfilled our quota usually finished between 11 and 12. If we finished early we usually went for a run followed by umpteen lengths of the pool. Looking back now it was heaven!